Every now and again in the course of knitting a gansey I find I reach a point where it all comes together and I just get my head down and blitz it – usually when I’m in a mood to listen to music, too. So it is now. I’ve been listening to Haydn’s marvellous “London” symphonies (numbers 93-104) and knitting a lot, while outside Spring tries to make up its mind which side of the lion/lamb dichotomy it’s going to settle on (right now lamb’s coming up trumps and I can finally peel off those winter long johns and think about finally taking my Spring bath to wash off the bear’s grease that’s kept me warm through the winter). Of course, it helps not having to knit those blasted extra steek stitches – the back is some 10% narrower than the front, so whereas a front row (230 stitches) took a little over a quarter of an hour to complete, the back row (210 stitches) takes just 12-13 minutes. It doesn’t sound much, but it all mounts up. Plus I’ve got the patterns in my fingers now and (unless my mind is wandering, where it will go) the stitches have positively flown off the needles. One reason for the dramatic progress is that fact that I haven’t been doing any writing, of course. Though now the novel is finished I’ve been sketching out another one – all I need is some characters and a plot and I’m away – and I’ve also been knuckling down and trying to craft a synopsis for the last one to send to agents and publishers. Mind you, I don’t feel much pressure, because I haven’t really a hope in hell of getting it accepted by agent or publisher. These days you either have to have a recommendation from someone inside the publishing industry, or have incredible luck. (I have no contacts, and as for my luck…). Still, faint heart ne’er won fair publishing contract, etc. Bread. After dallying with all this fancy foreign muck – baguettes and ciabatta, and so on – I’ve felt a hankering for some good, old-fashioned, no-nonsense, soft white bread. 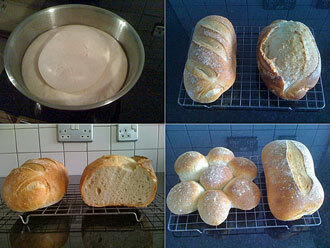 So I got some fresh yeast from the health food shop round the corner and knocked up a batch. I love working with fresh yeast – it’s much more responsive than instant (as you can see by the vast wobbling bubble that erupted from the dough like something you’d find in a book depicting the illnesses of sheep); though I couldn’t resist doctoring the recipe with a slug of olive oil and honey and a dash of sourdough starter. The bread is soft and chewy, with a crisp crust, and was made for strawberry jam. Literally. Finally, I’ve been thinking about Leigh’s idea of doing some classes. Or rather, Margaret’s been trying to persuade me that it’s worth considering, while I, on the other hand, fear being revealed as the Wizard-of-Oz-like charlatan that I really am. The debate still rages, but I mention this just to show that it’s still out there as a possibility. Perhaps those if you who’ve had some experience of knitting classes could let me know what form they take, what sort of thing they consist of, whether in your experience the tutor has ever been pelted with eggs or rotten tomatoes, that kind of thing…? 1. Fingers flying. I love it when I get to a place where I can do that. I have 2 Starmore Na Cragas going (love, love that pattern) right now. The first is almost finished, and the other is kinda is just starting. 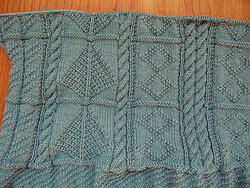 On the second, I am using yarn that I frogged twice because the pattern-yarn relationship just did not work for me. Third time is the charm. I think the reason that I love Na Craga so much is that it is basicaly an easy pattern, but the final product looks very expensive, and let’s admit it, Ms. Starmore knows how to craft a sweater, cables notwithstanding. 2. Bread. Now I remember why I have been saving those strawberry preserves all this time! I will take 2 loaves please. 3. Classes. I have very rarely heard complaints about the teaching quality of a certain instructor. I think that is all has to do with the instructor’s bottomless pit of patience that he/she may require for some of us that still dont get it the 10th time the looping-around-and-under thingy gets demonstrated. 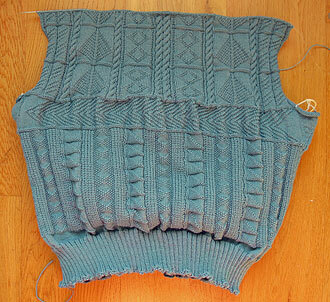 I truly envy your progress on the gansey; houseguests rendered my progress nil for a few days. So, Gordon, will your classes differ from your tutorial by showing a video? or – just how WILL it differ? The tutorial is so explicit, (and yes, I printed the whole thing out,) and I don’t know how you can get much better than that. And, besides, you make learning so much fun – why would anyone ever complain?! I enjoyed the book, made me a bit edgy anticipating my own “dreamland” every night, but… I was familiar with the Welsh Love Spoons because a mail order catalog that we use frequently once featured some of their woodworking tools and one of their known artist/carver’s Welsh Love Spoons. They were so beautiful and intricate that, out of curiosity, I checked the artist’s website and some of the spoons were up to $800 apiece! Good luck with publishing. I don’t know the pattern you mention – but Margaret has the book, so I’ll dig it out. My problem is, I have so many things in my mind right now that I keep waking out of a trance to find I’ve knit the wrong pattern for the best part of a row. My trouble with classes is that I have the patience required – I’ve been told by colleagues at work I should train as a teacher many times – but I’m not sure i have the technical command, other than “show and tell”. We’ll see. Good luck with the Na Cragas! Good evening, Lynne – I haven’t given any thought to content, not knowing what these things usually consist of. Knowing my presentations, about 10 minutes of stand-up comedy, 3 minutes of instruction, followed by 10-20 minutes of things that have just occurred to me. I’m glad you managed to read the book. I know it’s not going to appeal to everyone – it is, basically, a fantasy novel written as if it was literary fiction, in which 30% of the action takes place in the afterlife, and in which everyone sits around and talks for several hundred pages. It’s a niche market, but I think I’ve got it nailed! The old wooden love spoons are things of great beauty – Brecon Museum has quite a collection. And they are symbols of real power, I think, which is why I had to use them in the novel. I’ve never taken a knitting class (as my knitting clearly demonstrates) but in the course of practicing my profession, I’ve taken a number of continuing-education classes. I’ve never seen any flying fruit, rotten or otherwise, so I imagine that you’ll be safe. Even when I stumbled through presenting a short class on azimuth determination by astronomic observations (a technique made obsolete by GPS), most of my audience refrained from snoring. Er, that would picking up stitches for the sleeves . . .
You and me both, I’m afraid – I’ve never had a class either (though I do have Margaret the All-Knitter to turn to for advice and, ahem, ripping out after mistakes…). 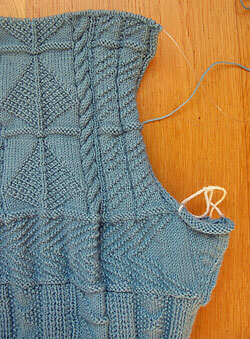 Picking up stitches is the bit of a gansey I enjoy the least – as is pretty clear from the blog! But it’s almost never as bad in practice as I think it’s going to be. The trouble is, the stitches run differently when you’re going up the front side of a sleeve to the way they run down the back – one side is relatively easy to pick up, the other slightly harder. Unfortunately we don’t possess a video recorder, or I’d try to do some video tutorials on these techniques (not least so I can remember what I do next time i have to do it myself). But I’m about to start picking up the sleeves of the cardigan in a week or two – stay tuned, and I’ll try to remember to go over it in more detail when I come to that point. Oh, and I take your point re classes, thanks – though I hope you’ll forgive me when I say that “azimuth determination by astronomic observations” reminds me of my teenage years spent deciphering the lyrics on Yes albums! You’re at the right point to take photographs, or have someone else take them, while you pick up stitches. another diagram, etc. The gansey is very handsome. I’d like to read A Stitch In Time. Well, I doubt I could manage diagrams, but maybe we could find someone who can draw. I think I find them the most helpful way of explaining things, & Pearson’s are particularly clear. Classes. I’d come along. My wife booked me in for one once, and although the ladies on the course were very welcmoming, I think they found the presence of a bloke, a tad off-putting. However, I did learn how to knit in the round with pointed needles which I could have never have achieved via books, Youtube or accident. I know of one craft place in Edinburgh that welcomes new knitting classes, if you fancy, old brick. One of the nice things about knitting ganseys is that some women, on discovering one knits, have a tendency to pat one on the head as if one was a precocious ten year-old who’s recited Gunga Din with only a few mistakes at the Sunday School treat – and when you produce what is in effect a Persian carpet in navy blue, their mouths hang open like performing seals most gratifyingly. Of course, I learned from Margaret who used to beat me with a wooden ruler when I got things wrong – still does, of course. Yes, I’d be interested in any opportunities Edinburgh has to offer. Tell me more, please. I was rooting for the Kiwis, but I do like the way the Sri Lankans attack all the time. However, much as I admire Murali, I still think his action is dodgy; and don’t get me started on Malinga the Slinger. Murali seems to have articulated joints like an old Action Man of mine. Ah well, he’s almost reached the end. But I heard someone on TMS saying that Malinga has one of the straightest arms in cricket – it just doesn’t get up higher than his shoulder!